When I think of chocolate I associate it with so many special moments as a child: bunnies for Easter, trick-or-treating for candy bars, and chocolate birthday cakes, but the thing I think of most as an adult is chocolate as the food of love. One of my favorite memories of falling in love with my husband is making and sharing hot chocolate made from Nutella one snowy evening. Chocolate appears in many of the books I’ve enjoyed from mysteries like Diane Mott Davidson’s Dying for Chocolate to science fiction with Kage Baker’s chocolate loving cyborgs in her Company series to the absurd humor of Robert Rankin’s the Hollow Chocolate Bunnies of the Apocalypse. But in books focusing on romance it often is a driving force in the novel. Three examples of this are in the magical realism of Laura Florand’s The Chocolate Kiss, Laura Esquivel’s Like Water for Chocolate, and Joanne Harris’s Chocolat. I fell in love with Laura Esquivel’s Like Water for Chocolate when I read it for a women’s literature course in college. The title comes from the fact that water to make chocolate must be almost at the boiling point, which reflects a passionate nature. The novel chronicles the life of Tita, who as the youngest daughter in her family is not allowed to marry her true love Pedro, but instead must care for her mother until she dies. Pedro instead marries one of Tita’s older sisters in order to remain close to Tita. Tita channels all her emotions into her cooking and as a result people who eat her food feel her intense emotions from passion to sadness. 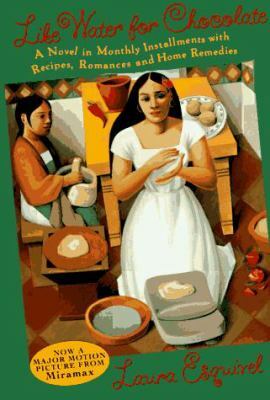 I remember being charmed by the 1994 movie when I watched it after reading Like Water for Chocolate for the first time, but have found it a little over the top in its execution when I watched it more recently when I led the library’s book discussion of Like Water for Chocolate during Hispanic Heritage month. Although I might not believe in the fairy tale ideal of “true love” quite as much as when I was in my early twenties there is still a lot of magic in Esquivel’s writing and her description of food. Although chocolate is in the title there are a number of other foods from wedding cake to quail with a rose petals sauce featured and several recipes are given. If you are interested in trying food inspired by Like Water for Chocolate or other great books, then you will definitely want to consider going to Novel Night, a delicious fundraiser run by the Friends of the Hoboken Library on October 18. You can get tickets and learn more at their website. I found The Chocolate Kiss a sweet read. 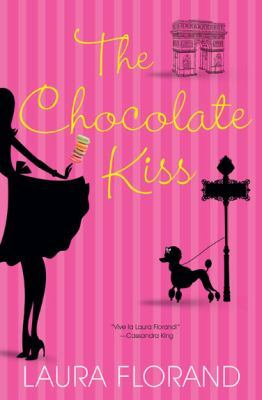 For those who may have sampled the nonfiction Parisian treats I had mentioned in a previous blog post, Florand’s The Chocolate Kiss provides a fictional spin on love and delicious delicacies in Paris. Magalie Chaudron works at her Aunt’s La Maison des Sorcieres, small tea shop in Paris’s charming Ile Saint-Louis (Florand claims she was inspired by an actual chocolate shop she had visited there). Magalie’s Aunt’s tea contains magical properties, but Magalie imparts her wishes in her delicious hot chocolate (a recipe is included at the end of the novel). When a new branch of Paris’s top pastry shop opens down the block, Magalie is ready for a fight to keep her Aunt’s shop in business, but is surprised to find herself drawn to the charismatic young pastry chef, Philippe Lyonnais who attempts to seduce her with a variety of macarons (these sound so delicious I wanted to run over to one of the French bakeries in town to buy a few of the trendy French cookies). Although the romance elements are nicely written by Florand, I found myself even more drawn to the story line of Magalie’s overcoming her feeling of rootlessness that came from moving with her parents frequently between America (the homeland of her father) and Provence (where her mother grew up). The story not only has Magalie finding love, but also herself. Those who enjoy Chicklit or New Adult genre works will find this a quick and enjoyable read. Several of Florand’s other novels, including the similarly chocolate infused romances The Chocolate Heart and The Chocolate Touch, are also available from BCCLS libraries. When I read The Chocolate Kiss, it reminded me a lot of Joanne Harris’s novel Chocolat which also centers on a magically endowed chocolate maker, Vianne Rocher. However, Chocolat is set in a small rural village in France rather than cosmopolitan Paris and there is a wider focus on the lives of the supporting characters such as the timid Josephine, who are affected by the magical chocolates of Vianne. I loved the way that Vianne was able to pick out each character’s favorites and that their choices would be reflective of their innermost self. In some ways this is the reverse of Like Water for Chocolate, instead of causing people to feel Tita’s emotions, Vianne’s chocolates encourage the villagers to confront their own hidden desires. 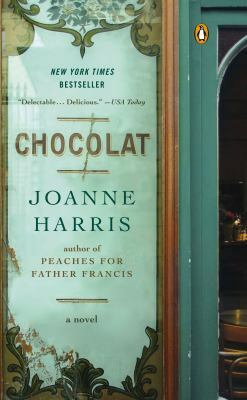 Harris followed up Chocolat with two sequels The Girl with No Shadow and Peaches for Father Francis, which did not quite capture the magic of the original for me, but are interesting reads for those wondering what the next chapters for the characters are. I first encountered the movie that was based on the book staring Juliette Binoche and Johnny Depp and it is one the few cases where I am equally charmed by the theatrical interpretation as the original print work. Out of the three novels, this would be my favorite, but all are worth sampling. You’ll be tempted to have a cup of hot chocolate while you enjoy these books. If you want to try my own recipe for romance and have hot chocolate made with Nutella for a hazelnut infused chocolate treat, you can try Martha Stewart’s version, which makes a perfect two person portion for those who want to share with their love.